Mossy Creek Stables offers modern facilities and full service training in the beautiful countryside of New Hampshire's Monadnock region. Mossy Creek Stables offers private or group training & riding instruction, round pen sessions, problem horse issues and trailer loading clinics. You can bring your horse(s) or use one of ours and bring back the techniques you will learn here to your own farm. Session times can be booked in two hour increments up to a six hour day clinic. We will customize your training sessions to meet your needs. Our training methods are all based on natural horsemanship principles and we will teach you the rewards of communicating with your horse and every horse in the future that you will work with. Mossy Creek Stables also offers Equine Massage for your horse and Thai Massage for you, with licensed therapist Mariko Hevette. At Mossy Creek Stables, we believe that good horsemanship begins not in the saddle but on the ground where you can learn your horse's natural instincts and communication system. Under the tutelage of our expert trainer, horse lovers of any age and background - from novices who want to form a bond with their first mount to more experienced riders who need to overcome behavioral or emotional problems affecting their performance - can learn natural horsemanship skills. These concepts are essential tools for developing a partnership, based on trust and respect, in which your horse will want to be with you and look to you for direction. From this foundation, the partnership can more easily be taken to higher levels of leadership in training for jumping, dressage, reining, driving, and other specialized interests. 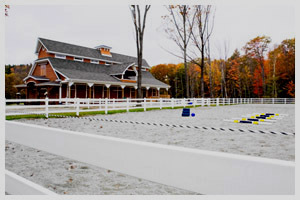 Mossy Creek Stables offers modern facilities, including comfortable personal accommodations for extended stays if desired, in the beautiful countryside of New Hampshire's Monadnock Region - the perfect environment in which to learn the "language” of the horse and start on the right track to a lasting, mutually rewarding relationship. Individual instruction and natural horsemanship clinics are available. Training in driving, logging, english and western are also offered and are highly recommended as a valuable complement to the natural horsemanship instruction. Contact us today at 603-878-1299 or by email of mossycreekstobles.com for information and reservations.